Improve and maintain the health of your skin with our skincare treatments, nonsurgical procedures, and cosmetic enhancements. Let us rejuvenate your skin with aesthetic services for the face and body with chemical peels, lasers, or nonsurgical treatments. Awareness of a nail abnormality is valuable for total body health and general well-being because it can be an indicator of other diseases. Dr. Aspacio is an expert injector of cosmetic injectables, he can gorgeously touch up most areas like small lip lines to Crow’s feet. Diseases that affect the skin have a deep and widespread impact on your life. Dr. Aspacio can provide compassionate care for skin cancer. If you have alopecia, dandruff, or hypertrichosis, we have experience in treating your condition to hep you look and feel your best. Summerlin Dermatology and board-certified dermatologist Dr. Reuel Aspacio believes that beautiful skin is within reach. When you are looking for an amazing doctor to trust with your dermatological health and well being, we invite you to make an appointment to meet with Dr. Aspacio, who offers individualized treatment planning at his practice in Las Vegas, NV. With more than 20 years experience and an extensive medical education, Dr. Aspacio has delivered excellent skin care to men and women no matter the condition of their skin. 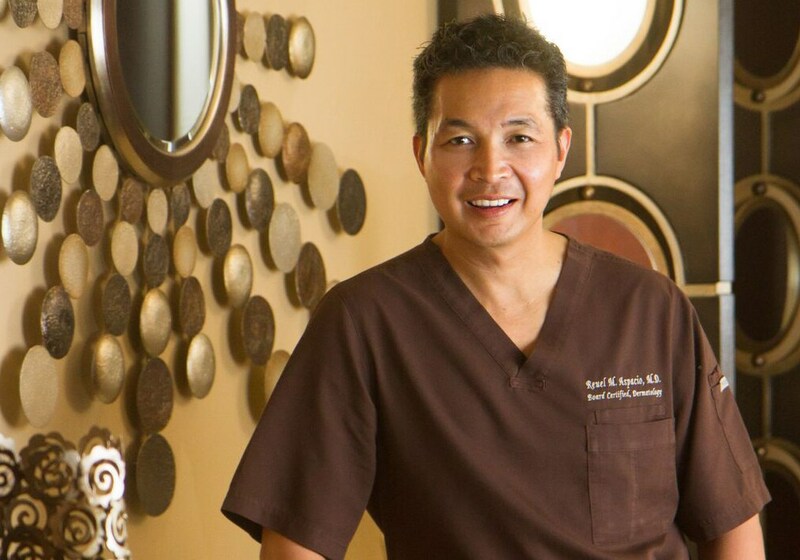 Throughout his career, Dr. Aspacio has performed thousands of procedures healing common skin conditions, enhancing aging skin, treating malignancies of the skin, and achieving time-tested results for his patients. He is an award-winning dermatologist that is recognized as an expert injector for cosmetic injectables (wrinkle relaxers and dermal fillers). Dr. Aspacio offers only high-quality products at his practice to pamper your skin in the office or at home. To learn more about Dr. Aspacio, please call and schedule an appointment to meet him in person for a private consultation about your skin condition. Founded by our board-certified dermatologist and expert injector, Dr. Reuel Aspacio, Summerlin Dermatology has made general, cosmetic, and aesthetic dermatology available for patients of all ages since 2001 in Las Vegas, NV. Alongside Dr. Aspacio, our licensed and certified medical staff members believe in providing personalized care with first-rate treatments in a comfortable and relaxed setting. This makes a difference in our patients', men and women, lives. We are prepared to answer questions and address concerns in a friendly and professional manner because the health of your skin is our number one priority. This is by far the best medical practice experience I've had since living in Las Vegas for a year. I believe my RN was Alice Dreyfus. She spent time with me and was personal. A quality so rare to find these days in the medical field. She went over all of my concerns with me. The office was clean, neat, professional. I will definitely be back. Thank you Summerlin Derm. for you professionalism, kindness, and customer service. Keep it up. Healing, and helping my problems. Very kind and understanding of my condition. Loved his staff and work. They staff and doctor are so very nice and helpful I would recommend them to everyone ?? From diagnosing a common skin condition like acne to treating precancerous cells before a malignancy develops, our dermatology team will deliver the latest treatments with cutting-edge technologies to get your skin back to a healthy state. For our cosmetic and aesthetic skin care patients, we have a wide range of medical-grade beauty treatments that range from chemical peels to laser treatments that can change the surface of your skin for the better. Dr. Aspacio offers anti-aging injectables (like BOTOX and Restylane), nonsurgical body contouring, light therapies, and vein treatments to bring out the best in your beauty. Schedule your appointment at Summerlin Dermatology with our friendly office staff who will work to fit your schedule. Tour our beautifully decorated facility where we uphold the highest safety standards in dermatology protocols today. Discover the different types of nonsurgical procedures and aesthetic services we offer in medical, general, and cosmetic skin care. Browse through reviews of Dr. Aspacio and his team to read what kind of results are possible when you choose our practice.